yes i know this is newschoolers but i know some of you MF are good at coding and im stuck as hell.and all the other compsci forms arent much help with this. I have the questions and answers saved in a 2D array of size 20x2, mathProbs[j]; i being questions j being the answers. how do I output only questions and then check if the input matches the answer stored? I can output both but I cant get it to output only one without an error, I also need it to step one down the list (array)after each answer. here is what i got thus far. NS cut my code inhalf so idk wtf happend here it is again. 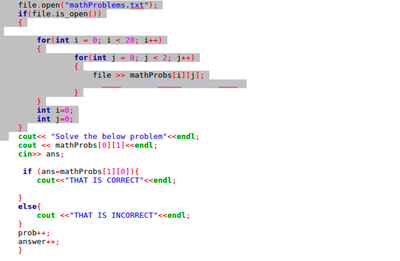 Iliveinutah NS cut my code inhalf so idk wtf happend here it is again. One thing I see that may be an issue is your if statement checking if ans is equal to mathprobs... You are using a single = which is usually an assignment operator, not an equality check (unless you wrote an operator overload). So in your if statement, mathprobs value is being assigned to ans, probably not what your going for. I don't know what data type the array mathprobs is, (std::string, char*?) Maybe you should look into a standard string compare function, or write your own... I believe it outputs a 1 if the strings are the same. I guess another question I have is about your design choice on why your using a 2d array...those things get really confusing (to me at least) Things might be a lot easier if you just had 2 arrays. One for mathquestions, the other mathanswers? That way you could step through the questions and answers simotaneously with 1 index, in a for loop.. it might also clear up some of your issues displaying just the question, or just the answer. I actually have written a similar program, but just in c and about math problems, but I think the algorithm is very similar, and the syntax in c is very close to c++ so If you are still stuck, feel free to send me a message, I might be able to send you code snippets and try to help you out. "How do I output only questions?" 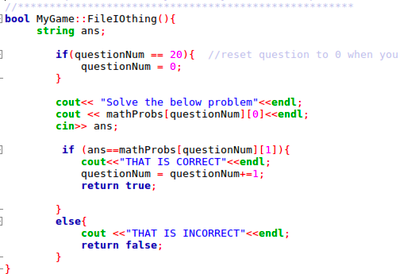 You're pretty much already doing it, instead of cout MathProbs write another for loop and cout MathProbs[ i] so it'll iterate through your 20 questions but not through the answers/questions array. "How do I check if the input matches the answer stored?" besides what the other guy said about using = instead of == I also noticed on your single question you print MathProbs as the question (so question 0, assuming the 1 is the question element on the 2nd dimension of the array) but then you compare ans to MathProbs[1 ] which would be the answer element of question 1. Just from what I can see you would be wanting to use if (ans == MathProbs[0 ]). I'm not too great at C++ so I can't really help unfortunately, but I would suggest that you drop your code/examples in Pastebin and then link it here as needed. my thinking when it came to how 2D arrays where numberd was my issue the whole time, you nailed it in your explination. I ended fixing it because of your help and now my drinking game is up and running, and i belive i got a half decent grade.